Can our goal of maximizing the value of the shares conflict with other goals such as avoiding unethical or illegal behaviour? In particular, do you think issues like customer and employee safety, the environment, and the general good of society fit into this framework, or are they essentially ignored? Support your views with specific exs. As an investor, do you think some managers are paid too much? Do their rewards come at your expense? Support your argument with relevant exs. You wish to deposit $250,000 for one year and have had the following quotes from three different financial institutions. For each quote state the interest that would be earned and the effective annual interest rate. i) You made four payments of $500 into an account every three months starting in three months' time, and you have $2,091.81 in your account in one years' time? ii) How would your answer in (i) change if the first payment was made today and all other factors remain constant? superfund and draw funds as required. How much will Mary need in the fund on her 65th birthday, given annual withdrawals of $45,000 (20 withdrawals) the first on her 65th birthday, such that there is nothing left in the fund on her 85th birthday? If Mary currently has $60,000 in her fund and her employer contributes annually as described above with the next contribution on her 41st birthday, and the last on her 65th birthday, how much will the fund be worth on her retirement? How much extra does Mary have to contribute on an annual basis, to meet the target on her 65th birthday (as determined in (a) above)? If Mary contributes $1,000 for the next 10 years and $3,000 for the remaining 15 years, will she still meet her target? You have decided to invest in a company, Joint. Co., which has developed a new coupling joint which you believe, has great potential. The company is due to pay its first dividend of $0.30 in one year's time. Your research has shown that after the first dividend payment, you expect the dividend to grow by 8% for the next two years, 12% for the following two years, before settling into its long term growth rate of 6%. How much would you be willing to pay for a share in the company today given that you require a return of 9.5%pa? To fund its research Joint Co. initially issued 10 year bonds two years ago with a face value of $1,000 and a coupon rate of 7%, paid semi-annually. i. If the yield on these bonds is currently 9%, what is the price of a bond today? ii. It is expected that the yield on these bonds will fall to 6.5% in four years' time. What will their price be at that time? iii. describe why the yield on the bonds may fall, and the effect this fall will have on the price. This case is intended to be an introduction to the various methods used in capital budgeting and looks at some of the decisions that may have to be made when evaluating projects. It is also designed to develop skills in using spreadsheets. You should set up a spreadsheet at the start to help analyse the problems. When using a spreadsheet, any tables that you wish to present to the reader should be embedded into a Word document as an ordinary table. Although he was hired as a financial analyst after completing his business degree, David Ong’s first assignment at Wang Systems was with the firm’s marketing department. Historically, the major focus of David’s sales effort was on demonstrating the technological superiority of the firm’s product line. However, many of Wang’s traditional customers have embarked on cost-cutting programs in recent years, and as a result, Wang’s marketing director asked David’s boss, the Chief Financial Officer, to lend David to marketing to help them develop some analytical procedures for the sales force to use that will demonstrate the financial benefits of buying Wang’s products. Wang Systems manufactures fluid control systems that are used in a wide variety of applications, including sewage treatment systems, petroleum refining, and pipeline transmission. The complete systems include sophisticated pumps, sensors, and control units that continuously monitor the flow rate and the pressure along a line, and automatically adjust the pump to meet preset pressure specifications. 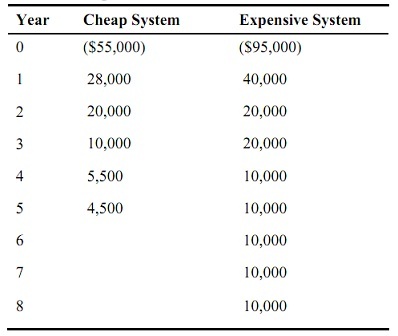 Most of Wang’s systems are made up of standard components, and most complete systems are priced from $50,000 to $100,000. Because of the highly technical nature of the products, the majority of Wang’s sales force have backgrounds in engineering. As he began to think about his assignment, David quickly came to the conclusion that the best way to 'sell' a system to a cost-conscious customer would be to conduct a capital budgeting analysis which would demonstrate the system’s cost effectiveness. Further, he concluded that the best way to begin was with an analysis for one of Wang’s actual customers. This system would replace a control system which has been used for about 20 years and which has been fully depreciated. The costs for removing the current system are about equal to its scrap value, so its current net market value is zero. The advantages of the new system are that (i) it would be more energy efficient, (ii) it would reduce waste, because the chemical processes could be more carefully controlled, and (iii) it would require less human monitoring and maintenance. In total, the new system would save SRC $25,000 annually in before-tax operating costs. For capital budgeting, SRC uses a 10% cost of capital, and the applicable tax rate is 40%. Mary Seong, Wang’s marketing manager, gave David a free hand in structuring the analysis. Now put yourself in David’s position and develop a capital budgeting analysis for the fluid control systems. As you go through the analysis, keep in mind that the purpose of the analysis is to help Wang’s sales representatives sell equipment to other nonfinancial people, so the analysis must be as clear as possible, yet technically correct. In other words, the analysis must not only be right, it must also be understandable to decision makers, and the presenter – David, in this case – must be able to answer all problems, ranging from the performance characteristics of the equipment to the assumptions underlying the capital budgeting decision criteria. What is the project's net present value (NPV)? describe the economic rationale behind the NPV. Could the NPV of this particular project be different for SRC than for one of Wang's other potential customers? describe. find out the proposed project's internal rate of return (IRR). describe the rationale for using the IRR to evaluate capital investment projects. Could the IRR for this project be different for SRC than for another customer? describe. Suppose one of SRC executives uses the payback method as a primary capital budgeting decision tool and wants some payback information. a. What is the project's payback period? b. What is the rationale behind the use of payback period as a project evaluation tool? c. What deficiencies does payback have as a capital budgeting decision method? d. Does payback provide any useful information regarding capital budgeting decisions? Under what conditions do NPV, IRR, and PI all lead to the same accept/reject decision? When can conflicts occur? If a conflict arises, which method should be used, and why? A second capital budgeting decision that David developed was the choice between two different Wang’s products. Again, using SRC as a model he produced the following figures. Both systems are part of Wang's general inventory, and therefore can be replaced indefinitely in the future. Using SRC's cost of capital of 10%, which system should be purchased? Why? A third capital budgeting decision that David is able to make is when to abandon a system. Consider a system that has an engineering life of 4 years (that is, the system will be totally worn out after 4 years). However, if the system were taken out of service, or 'abandoned' prior to the end of 4 years, it would have a positive salvage value. Here are the estimated net cash flows for the system. The relevant cost of capital is again 10%. What would the NPV be if the system was operated for the full 4 years? What if it was abandoned at the end of Year 3? Year 2? Year 1? What is the economic life of the system? Chelsea is expected to pay an annual dividend of $1.26 a share next year. The market price of the stock is $24.09 and the growth 2.6 percent. What is the cost of equity? Question 1 . An organization owes £300,000 tax at 1.7.X4 and £450,000 at 30.6.X5. Its income statement for the year to 30.6.X5 includes a tax charge of £400,000. How much tax was actually paid in the year to 30.6.X5?